You can stuff turkey with whatever it occurs to your mind. And this recipe could give you the idea of your next holiday dinner. 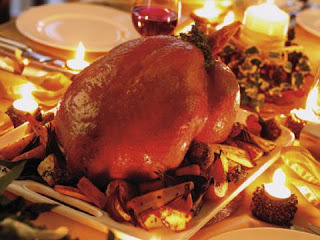 Stuff the turkey with quinces, raisins, almonds and minced meat and you will discover the pleasure of flavors. 1. Clean, wash and dry the turkey. Salt and pepper it inside and outside. 2. Chop the onion and brown it with a bit of butter. Wash the quinces, peel and chop them on cubes. Stew them for 5 minutes, just to getting soft. Raisins are saturated on water and strained off. Crush almonds into small peaces. Mix the onion with the mince, quinces, raisins, almonds, the finely chopped dried pepper and gloves. Salt the mixture and stuff the turkey with it. Spread butter on the turkey and place it in a deep baking dish. Pour some water in the dish. 3. Bake it in a moderate oven for 4 hours. Wet the turkey with the gravy from time to time. 4. When the turkey is cooked, take the gravy and pour into a deep pan with the wine. Thicken the sauce with pouring dissolved flour in cold water in it. 5. The turkey portions are served with the sauce. Do you like Bulgarian food? Schnitzel from mince and potatoes.